It took awhile but it looks like Travis Boyd has finally cemented himself on the Capitals roster. 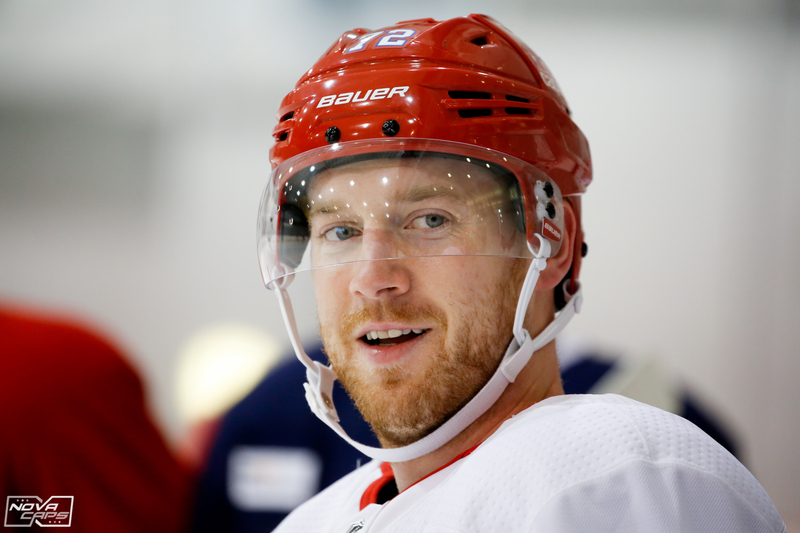 Going from a sixth-round pick, to two promising American Hockey League seasons, to now finding himself on a steady scoring pace for the defending Stanley Cup Champions, is Boyd has certainly had quite the pro career to this point. He hasn’t been a consistent presence in the lineup, but when he has been, his tenacity and passing ability has really stood out, and he’s showing the coaching staff that he deserves to be on the ice. In 13 games played, Boyd has one goal and seven assists. Of his eight points, six of them are primary points. He’s averaged 4.0, 5-on-5 points per 60 minutes. That is first on the Capitals, the next-closest being 2.89. Compared to the whole league (those who have played at least 100 minutes) he ranks second, which sandwiches him between Victor Arvidsson and Auston Matthews. When it comes to his 3.0 primary points at 5-on-5 per 60, he ranks first on the Caps and seventh in the entire league between Matthews and Patrice Bergeron. That is some amazing company to find oneself in. Where he usually gets knocked, though, is his underlying numbers. For the season, Boyd has a -5.78 Relarive Corsi For percentage (shot attempts percentage relative to the team) and a -11.73 Relative Expected Goals For percentage (expected goals% relative to team). That’s not good, but it’s important to note that he starts in the offensive zone only 38.46% of the time, the worst on the Capitals and 55th-lowest in the league, which is very surprising. It seems a bit unfair to put, in terms of overall experience, a rookie on the fourth-line then throw him in the defensive zone for the majority of his starts. Of the 54 forwards ahead of Boyd in terms of poor offensive zone starts, only 17 had positive expected goals percentage. It’s not an easy thing to be shelled defensively and be positive in underlying numbers, especially as a young player. 13 games certainly isn’t a huge sample size, so to bash Boyd on his analytics is unwise. On the flip side, it’s also not a big enough sample size to praise him for his great offensive start. Obviously, Boyd will not hang with names like Matthews, Arvidsson, and Bergeron but it doesn’t take away from what Boyd has done with what he has been given so far this season. It will be interesting to see if he can stay in the lineup once T.J. Oshie and Tom Wilson return, or will he be eating nachos in the press box. The Capitals have been playing pretty good hockey of late, getting goals from their bottom-six and Boyd is certainly part of that. As long as he’s producing he’s more than likely to stay on the ice. This entry was posted in Lineups, News, NHL, Offense, Players, Washington Capitals and tagged Analytics, First Goal, Luke Adomanis, NHL, Offense, Travis Boyd, Washington Capitals. Bookmark the permalink. AC is getting top line minutes, but yes, if we had that scoring on the third line, look out. We needed to make room for the kids, so there is a bit of a rub. Right now I have DJ a smidge better than NW.